Microsoft | Web 2.Oh. . .really? 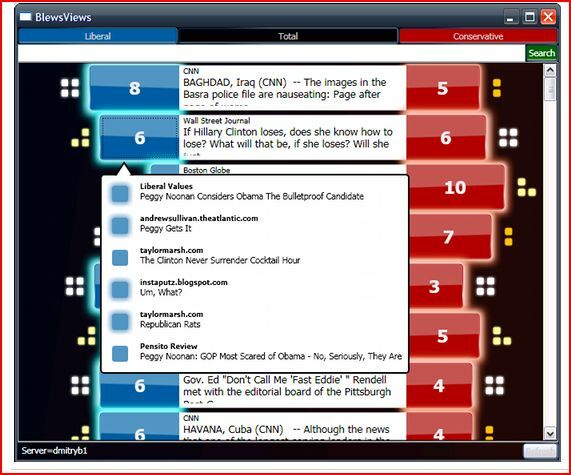 I came across this recent item on Microsoft’s “Blews” dataviz project, still in the lab, which visualizes how news items are linked to from the left- and right-leaning blogosphere–and shows how much “heat” each item generates. Here’s a reprint (with modifications) of a story of mine that appeared in The Washington Post today. Based on my recent visit to the Health 2.0 “Spring Fling” conference in San Diego, hosted by the brilliant and beautiful Matthew Holt and Indu Subayia, it runsdown what appears to be shaping up between Google and Microsoft in the consumer-PHR-platform space. I’ll be adding other entries about Health 2.0 products in the coming days and weeks. Personal health records, or PHRs, were the buzz at last week’s Health 2.0 Spring Fling conference in San Diego — especially recent entries by Google and Microsoft that have the rest of the industry energized, focused and at least a little bit frightened. Bill Reid, director of Microsoft’s HealthVault program, described the effort to integrate information technology into personal health care as a “long journey. We’re just at the front end of the process.” Was this an acknowledgment of the complexity of the task ahead? Or a a shrewd way to reduce expectations about the software giant’s big investment? Based on the tenor of the Health 2.0 conference–a high-energy gathering of great minds, big ideas and entrepreneurial hustlers–it may be both. In addition to Google and Microsoft, dozens of companies presented online products designed to make U.S. health care smarter, stronger and better looking. There was a plan by a firm called Organized Wisdom to offer online doctor consults at $1.99 per minute, a provider search tool pitched as “the match.com of health care,” and an electronic medical record by a firm called Myca that made you want to bask in the sheer beauty of ear infection data. Here’s a look at where Microsoft’s and Google’s personal health record programs are now and where they may be headed. * Both companies claim the same ultimate goals: To create integrated online environments where you can create and store your personal records, get information, find doctors, make medical appointments, communicate online, manage medications, share information with providers and more. Oh, and with Microsoft and Google, there’s always that other goal: to dominate the world. * Both put users in control over what goes into the record and who has access to it. If there’s something you’d rather not share with your employer, insurance company or anyone else, leave it out. * Both are free Web-based services, meaning you can access the records without cost from any computer. The services are described as being as secure as online banking. Both companies pledge not to share your information without your explicit permission. * Both offer tailored searches that promise to filter out garbage and surface the gold. The story so far: Microsoft has assembled a list of companies that make products (glucometers, blood pressure monitors) or offer services (software that pulls in data from labs, hospitals, etc.) compatible with HealthVault. Use one of them, and data from the lab or your home blood pressure cuff automatically gets sucked into your HealthVault PHR. If you aren’t using one of these products or services, though, the only way to create your record now is by uploading existing documents — a recent page of bloodwork results, say — from your computer. Follow the money: Microsoft plans to make money by placing ads next to HealthVault search results. As with any search, some are text ads generated by keywords. Some are interactive ads promoting HeathVault-compatible devices or services. Some offer related books and products from Amazon. Anyone can use the HealthVault search, but if you want to save your results privately (a nice feature), you’ll need to sign up for a free HealthVault account. Curious observation: HealthVault’s search results are sometimes riddled with information from interested sources (supplement makers!?!) and below-gold-standard publishers. Do I really need a tailored, secure search to find a Wikipedia article on arthritis? The story so far: The first live-action test of Google’s PHR is a pilot project with Cleveland Clinic launched last month and expected to run six to eight weeks. Screen shots of the service suggest people can create their own PHRs via simple forms with check boxes and pull-down menus. Like Microsoft, Google plans to offer the ability to automatically pull in data (for example, X-rays and readouts from a pedometer) from devices, services and health-care providers. Google is encouraging use of open technology standards that will let the health world’s many different information systems talk to each other easily. Follow the money: Google doesn’t rule out the possibility of selling ads alongside search results or other Google Health services but says it has no current plans to do so. Next steps: After the Cleveland Clinic pilot, Google says it will digest what it has learned and move toward launch. No date is set. Curious observation: So why would Google take on such a big, difficult project — creating complex data exchange systems and storing all that personal information — if there’s no way to make money? Data show more than 70 percent of people seeking health-care information turn first to Google. A strong personal health dashboard linked to other Google services, including its cash-cow search business, can make sure those health-seekers stay with Google rather than with the competition. Like Microsoft, for instance. There have been attempts to boycott Google over the years. I sense a much larger, diffuse but potentially powerful one is on the way. In 2003 the company was accused of complicity with the National Security Agency in its attempts at citizen surveillance; boycotts were organized. And almost whooly ineffective. In 2006 its decision to “censor” [whether that term really applies is open to debate] its search results at the direction of the Chinese government drew equally ineffective boycott attempts. Along the way other purported sins–among them Antisemitism and mistreatment of Adwords customers–have prompted the B-word. But these are issue-driven boycotts. I’m wondering whether something bigger, a sort of ABG (Anything But Google) moment is upon us. But if Google plans to compete for users in the social networking space with its own brand–at the same time it attempts to insert itself in the middle of the mobile phone market, and place itself in the center of personal health care with Google Health, and plow ahead with a big, potentially anticompetitive merger over tough industry and government scrutiny–the Mountain View juggernaut may hit a tripwire. Add the $700 per share stock price and it could hit a wall. I sense, in tinny noise from the blogosphere and in the grumbles of civilians I know who like to kvetch about their dealings with personal technology, an accumulating resistance to Google hegemony. It’s awfully similar to what happened to Microsoft when developers, state attorneys general, the federal government, business users, IT managers and consumers all began, for different reasons, to oppose the Redmond colossus. This led such things as traction for open source software, Linux, software-as-service, competition in the IT backend market, the rise of Firefox–in short, to humbling Ballmer & Co. a bit. From my viewpoint, the world has become a better place for it. And now, my ear-to-the-rail picks up vibes that it’s Google’s turn, with consumers and businesses alike moving to an Anybody But Google phase. Not just for reasons of fears about privacy and company bigfooting, but simply because there’s a growing sense that as it has grown the Don’t Be Evil crowd has lost the capacity to live by its own motto. I’m not organizing or advocating a boycott. And Lord knows nobody’s search engine is about to topple Google from that pinnacle, Ask.com’s funny but sadly desperate TV ads notwithstanding. But I feel a big ABG phase is about to begin. I, for one, plan to make strictly ABG decisions about my cell phone. For as long as I can hold out.